On 14 December 1990, the United Nations General Assembly designated 1st of October the International Day of Older Persons. 1990 … it is already more than 20 years ago! People who signed the resolution at that time are now more than 20 years older. Some (most) of them probably are now considered as “old persons”. Do they still have the same view on elderly? Maybe the highlighted principles at that time (independence, participation, care, self-fulfilment, dignity, …) are too broad, too short, just enough? So, already a century ago 😉 people were concerned by the dramatic changes in the composition of the world population. Thanks to progresses and greater availability of preventive measures and treatments more people are living longer and healthier. Even in countries where fertility rate is high, there will be less and less working-age adults per older adult. 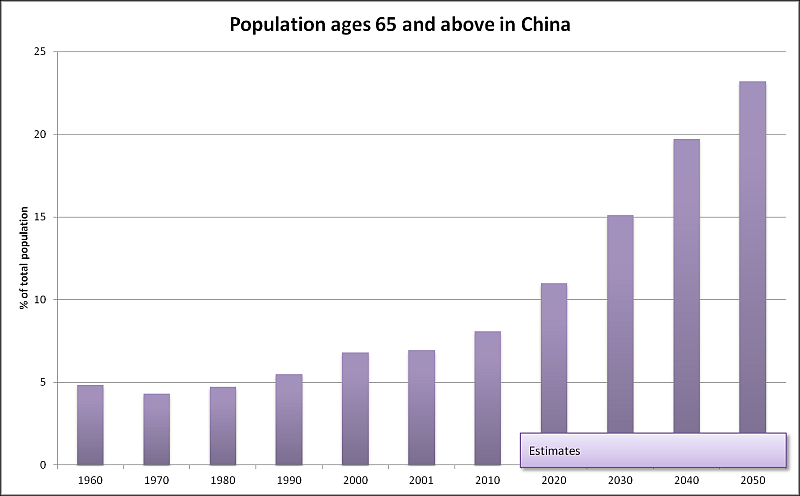 When you look at China, the percentage of people above 65 years old is projected to rise up to one fourth of the total population in only 40 years. Imitating other countries like the USA, UK, the Netherlands, etc., Belgium recently launched its Open Data Initiative. Well, don’t expect fancy graphs nor any “web 2.0” widgets, it’s only a repository of data made available elsewhere. Most (if not all) data is provided “as it is”, in proprietary formats and not easily combined nor even visualized. So I welcome this initiative but just wish it will be at least maintained and updated or, better, grown into something better, just like other government open data websites. A dream will be to have at least direct data manipulation online, downloads in open formats, a clearly open license and why not an open API? So, what about the elderly in Belgium? There is a section about population forecast by age (which comes from the economy ministry in Excel format). The Belgian population will continue to increase. 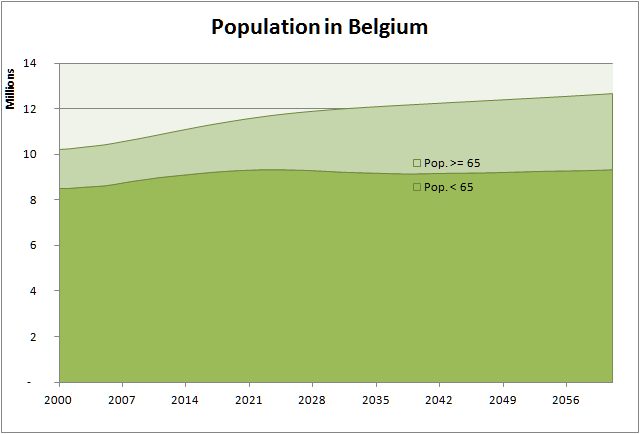 The older population in Belgium will increase faster than the younger population. But seen like this, the growth will not be very dramatic. 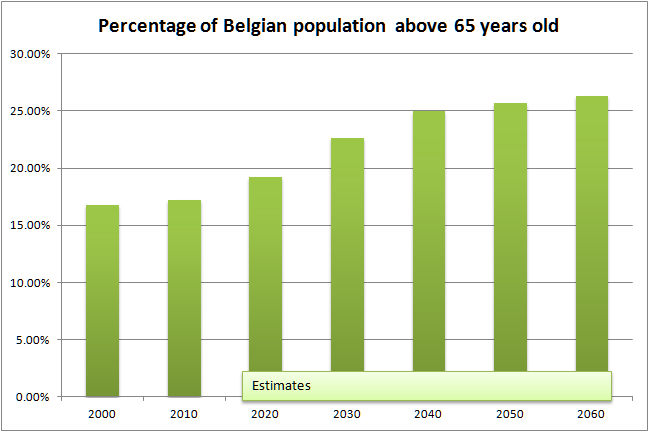 If we look at the projected percentage of people above 65 years old, we see that Belgium in 2010 is already at the same status as China in 2040. If experts say China will have an alarming percentage of old people in the future, the future is already here in Belgium! But it’s also true that Belgium took many decades to achieve this allowing some adaptations to take place. China will achieve it in only a few decades and will have to cope with these changes very quickly. UN highlighted some challenges and ways to overcome them at a country / government level. The main issues will be to maintain older people as much as possible the same levels of health and independence as they enjoyed during their active lives. N.B. For other sources of data in Belgium, one may be interested in visiting the Bureau fédéral du Plan, Statistics Belgium and the Statistics section of the National Bank of Belgium.